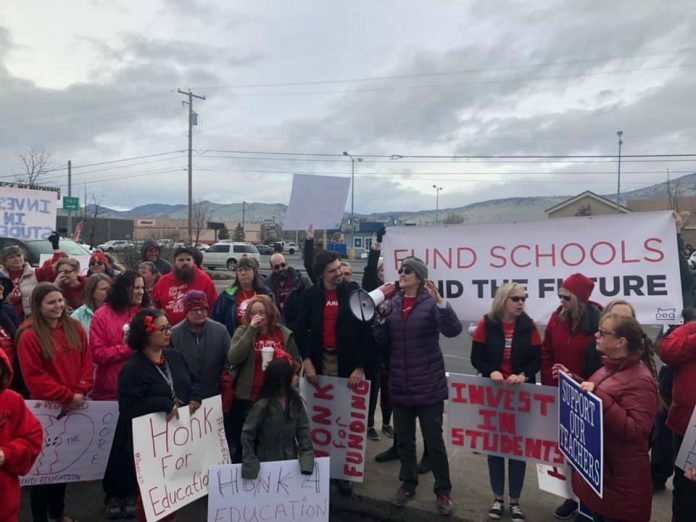 Yesterday, many people noticed the many educators, parents, students and other supporters who were rallying at the corner of South Sixth Street and Austin Street in Klamath Falls Oregon. The purpose of this rally is to call attention to the lack of funding for quality education in the state of Oregon from the state of Oregon. These individuals are rallying for things such as but not limited to smaller class sizes, culturally responsive teaching, more diversity when it comes to electives and ultimately more funding for quality education from the state. The Quality education model calls for a budget of $11.04, but yet the Governor is only funding about $9.42 billion, a difference of almost $2 billion. These teachers, parents, students and other member of the group plan to continue protesting this lack of funding causing numerous other issues and flaws in Oregons education system. The Klamath-Lake Uniserv Council will continue to “wear red for ed” and fight until their voices are heard and until they get adequate funding for their students from our state legislature.